In order to change the size one that is not one of the original sizes (135/80R13 to 185/60R13) i need approval from the manufacturer and to present it to the local Israeli MOT. I tried contacting Ford via email and via the local importer (Delek-Motors), but no response. I don't know how what is the legislation in the UK for those matters, but maybe someone has an original approval? or an idea how can i get one? There is no approval and we don't need it in the uk ,can't see you getting any as Ford won't want to know with such an old car and with a size was never available when new. Mk1/2's were only ever fitted with various sizes of 12 and 13inch wheels and tyres. As mentioned. Here, as long as the tyre is type approved and has the correct speed rating for the vehicle and is, of course, fit for the vehicle. i.e. It does not rub, protude the arches and had the correct tread depth. Then it is legal here. You are, however, obliged to inform your insurer of anything other than standard equipment fitted. 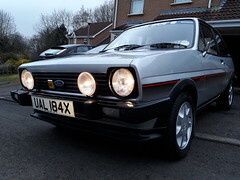 I understand Ford "Recommended" nothing larger than 15inches be fitted to a Mk1/2 Fiesta. But I do not know where that information came from. I think Ford fitted 194/45 x 15 to the Puma, which is Fiesta based (later model though) so maybe you could use that as support? No matter what i try - they simply don't return my messages. This is SO FRUSTRATING ! If there's no profit in it for them then they're not likely to bother. Can you not use the well tried British approach - namely fit the legal spec bits for the test and then take them off and fit the bits you want to use when you get home? 2. In case of an accident, the insurance company won't cover me. Would a 14" wheel from the RS accessory catalogue be of any use? sent you my email addr via PM.